At Chevron, we understand that people like variety on holiday. Be it restaurants, beaches or activities. 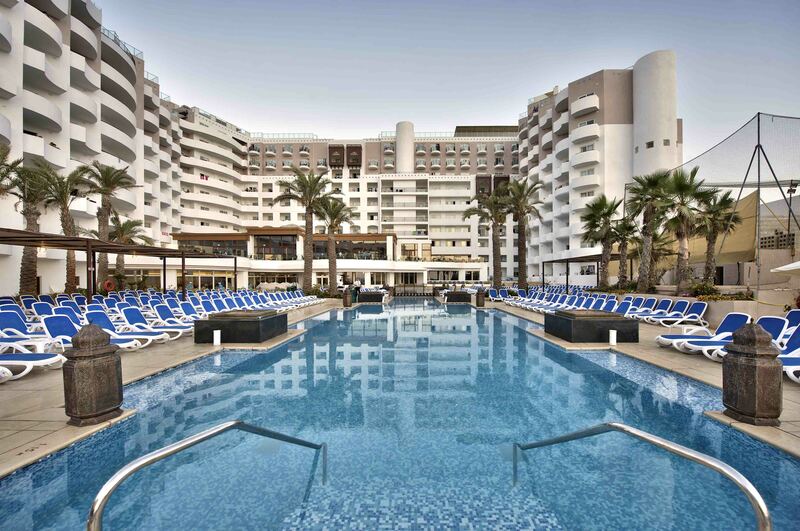 That’s why at the db San Antonio Hotel and Spa they have created a great pool scene with a total of three pools for guests to choose from plus two shallow kids’ pools. Each pool is unique in its own right and has its own individual feel. With warm temperatures, you can enjoy the outdoor pools all year around. There is also a heated indoor option in the wellness centre available for guests who are looking for some extra warmth. The main pool is nestled at the foot of the hotel. Why not take out a book from the hotel library and relax on a sun lounger for the afternoon? With regular appearances from the on-site animation team, they create a fun and relaxed poolside ambience. There are also a number of bars near to the pool area so you can cool down with poolside refreshments without going far to get it. 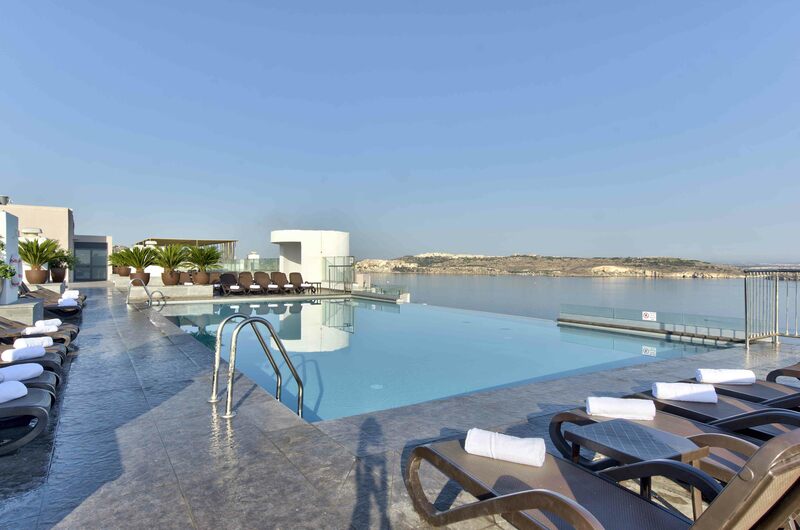 If you are looking for something a little more exclusive, the adults only roof top pool and bar boasts idyllic views over the surrounding bay and the Mediterranean. Here you can relax and enjoy a cocktail next to the infinity style pool. A stylish environment, this is an idyllic place to relax and appreciate the fantastic scenery. The wellness centre includes a large heated pool. This is ideal if you have had too much sun or for during the winter months. The 2 shallow kids’ pools are fully equipped to create a fun, exciting environment for your children. 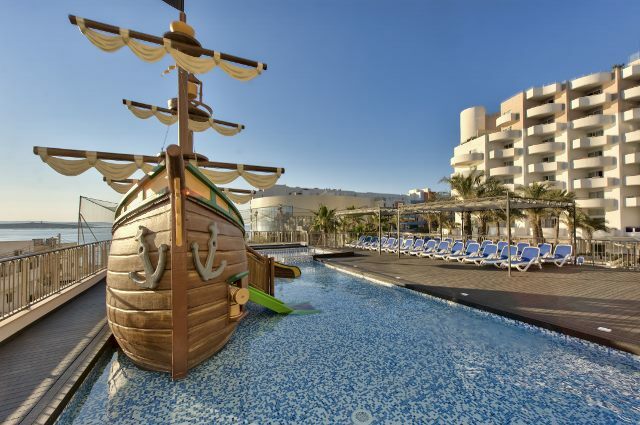 The main shallow pool comes with a large, built-in pirate ship with slides attached. The second shallow pool is also a fair size. There are plenty of sun loungers around the kids’ area so parents can keep an eye on their little ones while the children play in the shallows. Be sure to check out our ‘Photos’ section at the bottom of the hotel home page so you can see for yourself our wonderful selection of swimming pools. Online, over the phone or come visit us!